In celebration of World Dulce de Leche Day, I was invited to contribute a recipe featuring this rich caramel spread. Visit the World Dulce de Leche Day blog for more delicious links to recipes from bloggers around the globe. While Argentina certainly cannot claim exclusive rights to dulce de leche, it's undeniable that this tooth-achingly sweet yet addictive caramel spread is inextricably linked with Argentina. A staple ingredient in Argentine desserts, dulce de leche makes frequent appearances in ice cream, as a topping or filling in cakes, cookies and pastries, and in candies. 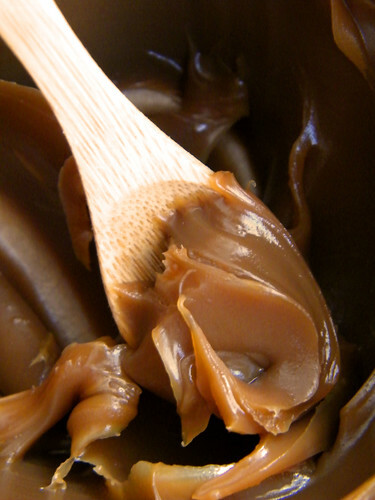 As local legend tells it, the birth of dulce de leche can be attributed to a culinary accident that occurred in 1829. With the hope of ending a period of civil war in Argentina, the leaders of opposing political and military forces, Juan Manuel de Rosas and Juan Lavalle, decided to call a truce. 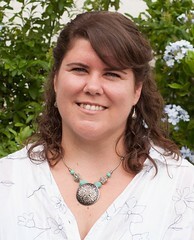 Rosas invited Lavalle to sign the Cañuelas Pact at his headquarters on a sprawling estancia [ranch] called La Caledonia. Tired after his journey to the estancia, Lavalle decided to rest a bit before meeting with Rosas. He lay down on a cot in the tent where Rosas normally slept and tried to grab some shut-eye. Meanwhile, one of Rosas' servants was busy preparing the lechada—hot milk with sugar—that was drunk as an accompaniment to mate during that period. When the servant went to take some mate to Rosas, she found Lavalle in Rosas' tent and panicked. Unaware of the planned meeting between the two leaders, she alerted the troops to the presence of the "enemy," leaving the lechada unattended on the stove in the chaos. When the servant finally returned, she discovered that the contents of the pot had turned into a thick, sweet, gooey spread—what we know today as dulce de leche. 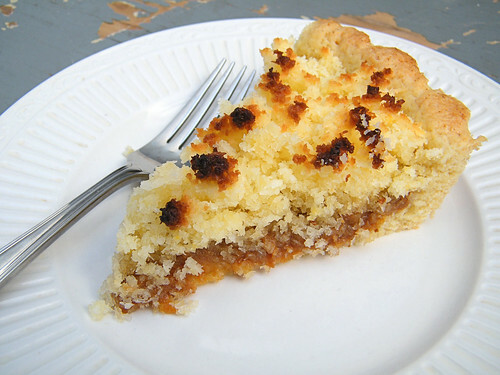 In honor of World Dulce de Leche Day, I decided to make a coconut and dulce de leche tart, one of my favorite ways to polish off a jar of dulce de leche. As anyone who's sampled a Samoa cookie from the Girl Scouts can attest, the combination of coconut and caramel can't be beat. 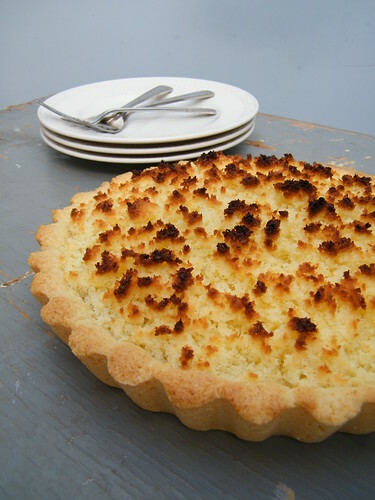 Here in Argentina, bakers masterfully pair these two ingredients in this simple tart with a shortbread crust. A slice of tarta de coco y dulce de leche with mate, coffee or tea will surely put a smile on your face. Of course, to make this recipe, you’ll need to procure some dulce de leche! If you're feeling adventurous, check out my previous posts about how to make homemade dulce de leche [stovetop methods] and crockpot dulce de leche. No time to whip up a batch from scratch? No problem—you can also order dulce de leche online. With a thick consistency similar to that of peanut butter, dulce de leche repostero is primarily used as a filling for desserts and pastries. It's difficult to find this type outside of Argentina, so go ahead and substitute regular dulce de leche if unavailable, preferably with a brand or homemade version that leans toward the thicker side. Regular dulce de leche might ooze a bit from your tart, but it will still taste decadent! This recipe calls for finely-shredded, unsweetened, dried coconut, a product widely available here in Argentina. 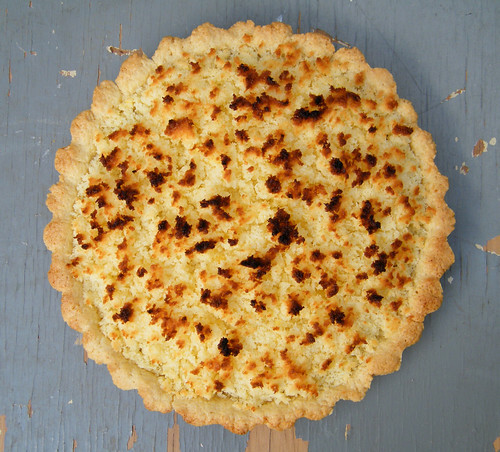 Do not use the sweetened coconut flakes typically found in American supermarkets, as they will alter the texture of the tart and make it overly sweet. Look for finely-shredded, unsweetened coconut at natural food stores, ethnic markets or purchase it online. Place the flour, baking powder, sugar and salt in a large bowl. Whisk to combine ingredients. Add the butter, and using a pastry blender or two knives, cut the butter into the flour until the mixture resembles coarse meal. Add the whole egg plus the yolk and the vanilla extract, and mix until the dough begins to come together [the mixture will look dry and crumbly]. Turn the dough out onto a lightly floured surface and knead just until combined [do not overwork the dough]. Shape the dough into a disc, and cover in plastic wrap. Refrigerate the dough for about 30 minutes. Preheat the oven to 350ºF. Lightly grease the bottom and sides of the tart pan. In a medium bowl, mix the coconut, eggs, sugar and cream for the filling. Set aside the mixture. Remove the disc of dough from the refrigerator. Pat the dough out into the pan, gently pressing and spreading it evenly over the bottom and up the sides of the tart pan. Spread an even layer of dulce de leche over the dough. Next, place heaping tablespoonfuls of the coconut mixture over the dulce de leche, creating small peaks all over. Do not smooth out the top. 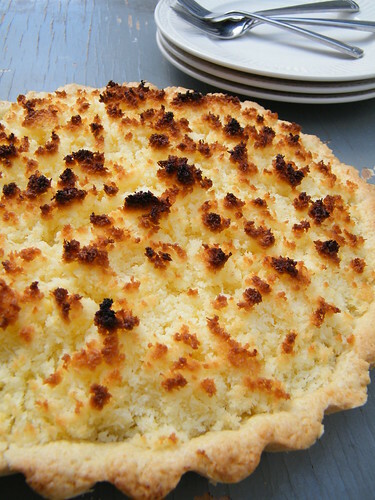 Bake the tart on the bottom rack of the oven until the top turns golden brown and the dough is fully cooked, about 35 to 40 minutes. Cover the top loosely with aluminum foil if the coconut begins to brown too much. Remove from the oven, and allow the tart to cool on a wire rack for 10 minutes before unmolding it from the pan. Let the tart cool completely before serving.